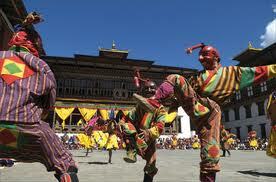 The Tshechu is a sort of festival where many beautiful dances go on and people receive blessings. There are mask dances including world record-jumps and twirls. Usually the last days of the Tshechu are the most popular; the blessings go on during that period. There are also clowns (also masked). You can see the mask of one in the left picture (the one with the red mask with its face to you). Occasionally, traditional Bhutanese plays are acted out, though this is uncommon, and the Tshechu consists mostly of dances. If you plan to go to a Tshechu, wear a good hat, bring water, and be generous with sun-lotion since the Tshechu is usually conducted in the afternoon, in summer, when the sun blazes on your unfortunate shoulders.